NO EXPERIENCE REQUIRED. Come learn the game of hockey from professional instructors who have your developing hockey players best interests in mind. We pride ourselves in our knowledge of teaching hockey fundamentals. We will work with each participant on a personal level to insure that we are teaching them the proper skills. We will take the time to teach the players at ‘their’ pace so that they can properly develop their skills. Each practice plan is designed by Certified USA Hockey Coaches who are dedicated to the success of player development. 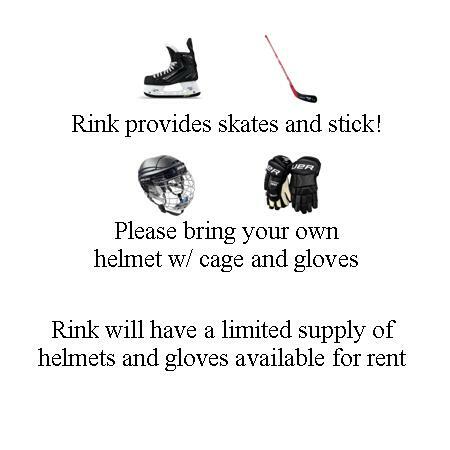 The Learn To Play Hockey program is designed for any individual looking to learn how to play the worlds fastest team sport. The best part is that there is no experience required. The program incorporates 3 different levels and will place kids accordingly based on age, skill and background. Class placement will be determined after the first clinic. This program will have a strong focus on the skating techniques necessary to play the game of hockey but will also include proper puck handling, shooting and passing techniques, stressing proper body positioning and balance. Participants will develop their skills through both group and individual instruction and will naturally progress through the program until they are ready to join a youth hockey team. Each session is 60 minutes long and available to all ages. Don’t miss out on the fun !